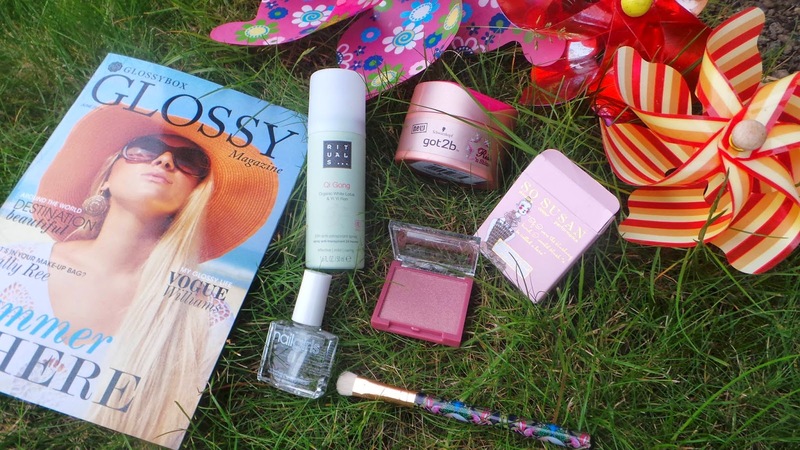 I have to say Glossybox pulled off one heck of a box this month, I am delighted with mine. The perfect summer box, which includes 4 full size products. My favourite item in the box has to be the Teeez Trend flat brush, the handle design is absolutely stunning and the natural hair is so soft. This brush is perfect for cream and powder based eyeshadow products ideal for precision application. I am also excited to try the So Susan Universal Blusher - the colour is really pretty, with a very subtle sheen. From the one swatch i've taken it is nicely pigmented, I don't think you would need much per application. Oh my goodness the Rituals antiperspirant smells amazing. I am useless at describing scents but it says 'White Lotus and YiYi Ren' if you have any idea what they smell like you will get where I am coming from. I adore Rituals products in general so I am pleased with this product. Perfectly sized for my handbag. As for the last two items, the hair soufflé and the 3 in 1 Nail polish, these are both very nice items also. That's so funny. We have a Glossybox also in The Netherlands. It's now called Prettybox. I like the look of the blusher, really unusual colour! That blush is a lovely shade - what a fabulous selection of products! Looks like a fantastic box! That's why I love glossybox so much-rarely disappointed! Looks like a very well curated box this month!